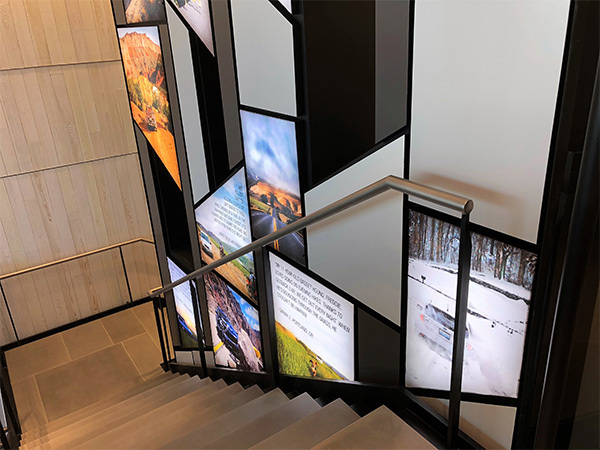 Implementing a successful wayfinding program is a complicated process, and tapping into AGS’s experience has a positive impact on project costs, efficiencies, and getting the job done right. AGS’s team of environmental graphic designers and planners have extensive experience in master planning and wayfinding. More than just signs, there is logic, strategy, and an orchestra of interacting visual communications that determine how easily people move about an environment. Sign planning also involves attention to an organization’s marketing strategies, expansion and maintenance needs, budgets, schedules, and compliance with ADA regulations and local building code. When a signage program is lacking, it causes people to become frustrated, confused, or lost…all of which have a negative impact on an organization’s image and brand. The true measure of any program is how well it works. Save time and money in the long run by getting the job done right the first time with AGS’s design build delivery system. AGS installers bring projects to life with their technical ability, attention to detail, problem solving abilities, and knowledge about federal and local regulatory requirements. AGS sets the bar high for manufacturing with quality materials and workmanship. We believe in providing value, and we care that signage purchased from AGS will last and look great for a very long time. AGS’s staff is highly skilled and the company continually pursues new technologies to support a commitment to excellence. AGS’s SIMplify™ web-based paper insert management program facilitates fast and easy updates of interior signage as needed. Regardless of whether you immediately need just one change-out or have multiple names recorded in an Excel spreadsheet, SIMplify™ ensures consistency of typestyle, font size, and copy placement every time!